Anyway, I’ve been a devoted fan of the Raimi/Campbell/Tapert triumvirate’s cinematic legacy for a very long time and, doubling as a fan of musical theater, have been absolutely in love with George Reinblatt’s lyrically campy, over-the-top stage production Evil Dead: The Musical since it first ran in 2003. From grainy, bootleg copies of original productions to bigger budget, traveling Broadway-style performances and low-budget community theater adaptations, I’ve never seen a bad rendition of this incredible story. Last year, I was absolutely blown away by director Mike Dobrzelecki and Radical Arts’ performance, which lived up to the hype as being the “bloodiest” production I’ve ever seen. 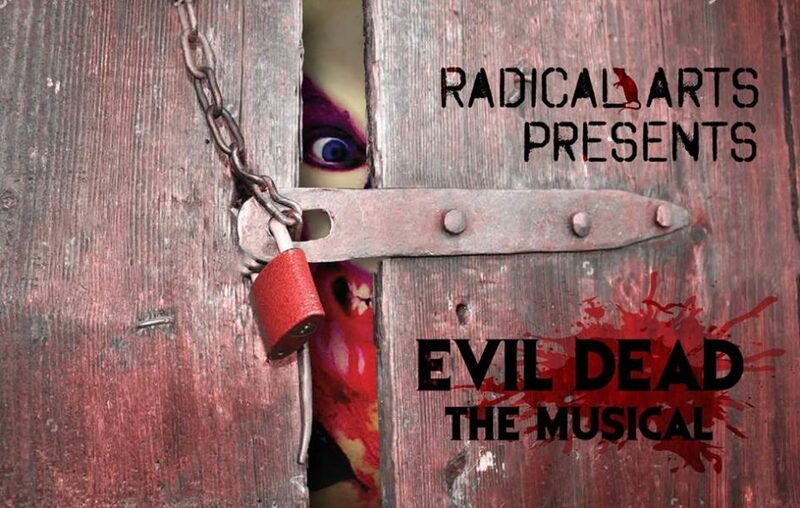 When I heard that Radical Arts was doing Evil Dead as their season opener this month, and that my friend, Mic Rex, was going to be involved, I jumped at the chance to talk to the cast. While former director Mike Dobrzelecki has moved on to focus on his film career (I’ll have a separate article to cover that soon), some cast favorites from last year’s performance are back and better than ever. Director Seth Limbaugh who, due to a medical emergency, was unable to make it for this interview session, has assembled an incredible cast to bring his own unique vision to the stage. Returning from last year are James David West and Jenni-Lee Merritt (Ed and Shelly respectively from the 2016 run), who play Ash and Linda this time around. Joining them are Brittany Juilfs (Shelly) and Hillary Mead (Cheryl), who are part of the RA Burlesque show, Down the Rabbit Hole, and are giddy to be a part of Evil Dead, which seems to be a sentiment shared by everyone. Jarvis Bynum (Scott), Mic Rex (The Moose and Professor Knowby), Paige Songer (Annie) and Asa Ambrister (Ed) all shared their thoughts in a roundtable interview that was as eye opening and entertaining, as it was chaotic. The entire cast is filled with veteran actors and, coming in to find them rehearsing a few numbers, was as amazing as I’d hoped. The set was coming together and you could clearly see that cabin in the woods coming together. Cheryl and Ash continued to make appearances as Mead and West reverted back into character. “Bad puns and blood are why I wanted to play Cheryl in the first place,” Mead said at one point. Meanwhile, the bromance of Ash and Scotty is in full bloom as the cast creates an interesting theory behind the duo’s man love. Everyone in the cast is either an old-school Deadite from childhood — like Brittany Juilfs, who remembers her father as being the reason she fell in love with horror after showing her The Evil Dead for the first time — or became fans after joining the production and seeing it for the first time. Agreeing that they were going to live up to the campy, slapstick comedy of the source material, fans can expect laughter, over-the-top musical numbers and gallons of blood. I’d like to thank the cast, especially since it took me until opening night to get anything done with this interview. Guys, I promise, you’ll see my review of the show up before the weekend is over. As for the rest of you, listen to the full interview below and be sure to click here for tickets while they last. 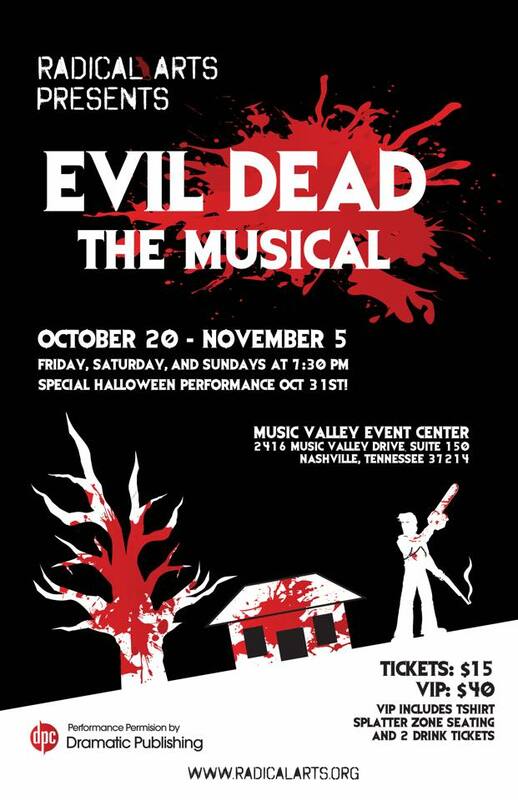 Evil Dead: The Musical opens today (October 20th) at the Music Valley Events Center and runs through November 5th. Come out and join us this Halloween season and be sure to come back to Zombies In My Blog later this weekend for my review from opening night. Video courtesy of Super Low Budget Productions/Danno of the Dead Blog.